Listen to some webinars The Business of Trust team have hosted where we talk to invited guests about topics related to clients, trust and the professional services sector. Key client programs – nearly everyone’s got one, but many suffer from a lack of engagement and traction, an overuse of forms and reporting, and long lists of clients that are simply unmanageable. So, what does it take to run a truly successful key client program? – what works and what doesn’t work. – how to measure success. – how to engage the business and business leaders into the program. He will also gives his tips on the best resources you can access to help with your own key client programs. 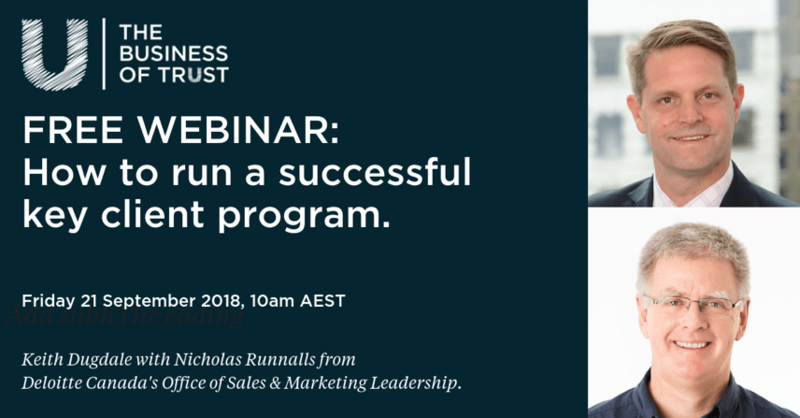 After watching the webinar, we hope you leave with a few new ideas that you can immediately implement to help drive your own key client programs to greater success. Tracking time with timesheets is still the most common way for firms to manage time and bill clients in the professional services and many other B2B organisations. But increasingly we’re hearing people say that there has to be a better way. That they would love to focus more on value rather than time – but they just don’t know if it’s possible, feasible, or even where to start. 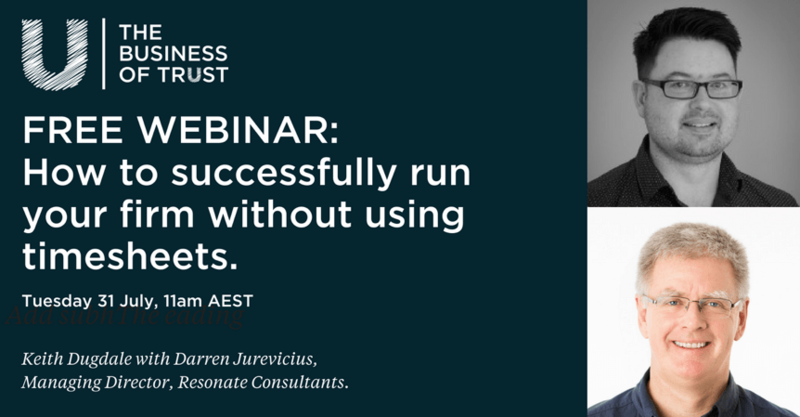 To discuss the ins and outs of going timesheet free, I chat with Darren Jurevicius, the Managing Director of Resonate Consultants, where he shares how their business, a Financial Review Fast 100 firm, works on some of the biggest engineering projects in Australia – without anyone in the firm ever completing a timesheet. How Resonate Consultants set up their business to be timesheet free. Why they decided to ban timesheets, and the positive impact this has had on their business. How they bill clients through value based pricing. What has worked well, and what are some lessons learned. Small vs large organisations….can it work in both? Darren’s top tips for making the change.